Robert Edeson was born in New Orleans, La., June 3, 1868. His father was a producer and stage manager thus creating an interest in acting for his son. He was educated at the Polytechnic Institute in Brooklyn, NY. He spent 25 years on the stage with one of his most popular roles being in the play "Strongheart" which ran for several seasons in New York and on stage. 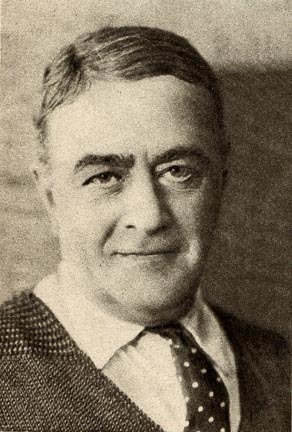 His first appearance in the movies is in 1912 for Thomas Ince. He worked with Vitagraph in the early years and was one of the original Lasky Stock Company. Some of his most popular films are "The Prisoner of Zenda" 91922) for Rex Ingram, "The Rag Man" (1925) with Jackie Coogan, "Eve's Leaves" (1926) and The Clinging Vine (1926) with Leatrice Joy" and several films for Cecil B. DeMille including "The Ten Commandments" (1923), "The Volga Boatman"(1925), "King of Kings" (1927) and "Chicago" (1927). He reportedly married and divorced actress Mary Newcomb and was married a second time to Aida Edeson who was not an actress. He enjoyed painting, writing, and collecting pewter and antiques. He died on March 21, 1931, of heart failure at the age of 62 in Hollywood, CA.